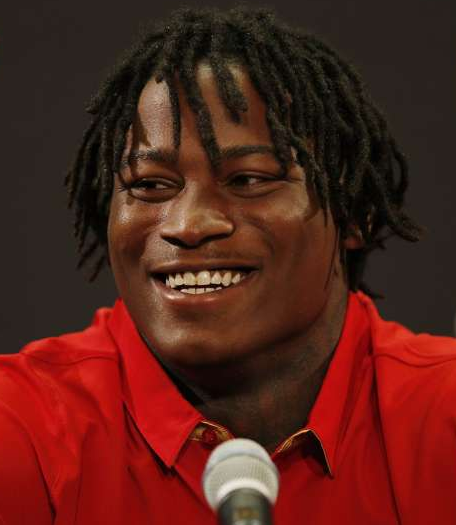 An American football linebacker who is currently a free agent is named as Reuben Foster. His playing position is Linebacker. He played football since his college time at Alabama. He was drafted by the San Francisco 49ers in the first round of the 2017 NFL Draft. He was named the Butkus Award winner, given to the nation's best linebacker, at the end of the 2016 college football season. Being collegiate linebacker currently playing for the Alabama Crimson Tide. For winning 2015 NCAA championship with the school. For winning Butkus Award winner as well as a 2016 unanimous All-American. San Francisco 49ers release Reuben Foster after domestic violence arrest. 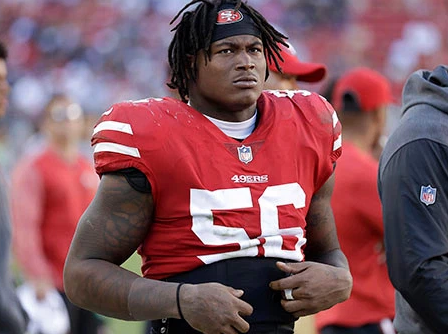 The San Francisco 49ers have released linebacker Reuben Foster after he was arrested on Saturday on suspicion of domestic violence. The 24-year-old was arrested at the Grand Hyatt hotel in Tampa, Florida before the 49ers' game against the Tampa Bay Buccaneers on Sunday. Foster had previous domestic violence charges dropped in May. The NFL suspended Foster for the first two games of this season, citing their conduct and substance-abuse rules. A custody report from the Hillsborough County Sheriff's Office confirmed the alleged victim of the assault had been in an on-again-off-again relationship for three years with Foster. Niner's general manager John Lynch and coach Kyle Shanahan stood by Foster as the previous domestic violence case played out, but both were emphatic that any more issues would likely result in Foster's release. On 4th April 1994, Reuben Foster was born. As of 2018, his age is 24. He was born in Roanoke, Alabama. His nationality is American. He was born to Inita Berry Paige and Danny Foster. His parents divorced when he was small. Later, his father shot his mother while she was carrying him on her back. In the year 1996, Dany Foster was arrested and indicted by a grand jury before he fled the state and was later caught moved to Randolph County but he managed to escape again and so he stayed away for sixteen years with a new identity in Miami, Florida. There is no any information regarding his siblings. His zodiac sign is Aries. Regarding his education, he attended Troup County High School and there he was part of the school’s football team such that he was said to be the best linebacker of his class. Later, he went to Alabama University. Foster has got an athletic body shape. He is very strong. He stands 6 ft 1 in or 1.85 m. He has a balanced weight of 103 Kg or 228 lbs. His other body measurement such as hip size, bicep size and more will be updated very soon. With his glowing smile, he attracts a lot of people towards him. His hair color is Black and eye color is Dark Brown. Foster started his career from his high school, Troup County High School, where he played high school football and was teammates with Quan Bray and J. C.
Foster finished his junior season at Troup County High School with 185 tackles, including 34 tackles for loss and 18 sacks. In his senior year at Auburn High, Foster recorded 80 tackles (70 solos) and two sacks, helping the Tigers advance to the quarterfinals of the Class 6A playoffs. Auburn High School lost 7-8 in a grueling, defensive battle to rival Opelika High School at Duck Samford Stadium. He debuted as a true freshman for Alabama University in the season-opener against Virginia Tech, registering one assisted tackle. He made his first career start at the middle linebacker position against West Virginia, compiling seven total tackles with two solo stops and a tackle for loss. He finished his sophomore season with 22 tackles including 11 solo stops, two tackles for loss (−5 yards) and one sack (−3 yards, against Texas A&M). He was also awarded the Butkus Award, given to the nation's best linebacker. As a senior in 2016, Foster finished with 115 tackles, 13 for losses, and five sacks. Later, he underwent a surgery on his right shoulder to repair a torn rotator cuff on 13th February 2017. On 20th April 2017, his urine sample was reported as dilute, which is treated as a positive test. He was ranked as the top inside linebacker prospect in the draft by NFLDraftScout.com, was ranked the top linebacker by NFL analysts Mike Mayock and Gil Brandt, and was ranked the second-best linebacker (behind Temple's Haason Reddick) by ESPN. In his 2017 season, he was selected by San Francisco 49ers in the first round (31st overall) of the 2017 NFL Draft. He was also the first of two linebackers drafted by the 49ers in 2017, along with Pita Taumoepenu. The 49ers signed Foster to a four-year, $9.03 million contract with $6.87 million guaranteed and a signing bonus of $4.71 million on 9th June 2017. He made his professional regular season debut and the first career start in the San Francisco 49ers' season-opener against the Carolina Panthers and recorded three solo tackles and deflected a pass during their 23-3 loss. He suffered the injury in the first quarter while pursuing Christian McCaffrey and was inactive for the next five games (Weeks 2-6). He finished the 49ers' 40-10 loss to the Dallas Cowboys with five combined tackles but left in the third quarter after suffering a rib injury. He finished his rookie season with 72 combined tackles (59 solos) and a pass deflection in ten games and ten starts. He has suspended two games for violating the league's personal conduct policy, stemming from a weapons offense and a misdemeanor drug offense on 3rd July 2018. He was released after a November 24, 2018, domestic violence arrest. The net worth of this famous and famed footballer is surely in millions. He is making a good amount of money from his outstanding career. His net worth is estimated to have $5 Million as of 2018. His exact salary is $450,000 as of 2018. He is satisfied with his earning. He is very successful in his professional life. Foster is not married yet and he is still to get married. But previously he was in a relationship with Elissa Ennis, his former girlfriend. She was born on 22nd February 1990. She had falsely accused Reuben Foster of domestic violence. She had falsely accused Reuben Foster of domestic violence and the case went to the court. She was testified in court issuing a contradicting statement to the claims and saying that Reuben Foster did not hit her, injure or threaten her on May 2018. She later spoke that she made up all the claims of domestic violence just because her feelings were hurt when Reuben put an end to their relationship after she had admitted fighting with a lady who gave her the bruises she had on her body. After that, their relationship ended. Foster is also a father of his daughter named A'Zyia with the younger sister of former Auburn linebacker Tray Blackmon. There is no more information about her with Foster. Currently, he seems to be single and focusing on his career. He has not been seen with any other lady in the public places and also he has not spoken anything to the media.